Understanding what price to charge a buyer is an important decision in any industry. Charging less than the manufacturing and operational cost is bound to create losses for the company while overcharging will make that same company non-competitive. Therefore, many companies hire industry experts to develop product cost and pricing strategies. Further, many companies invest in sophisticated software such as Gerber and Sew-Easy to calculate the most accurate Standard Minute Value (SMV) to provide the best efficiency while training employees and managers on various management systems, such as Lean manufacturing. How product costing is done? In a typical apparel manufacturing plant, the responsibility of costing falls to the account manager. However, often costing is delegated to a development and costing merchandiser. If an inquiry comes from a well-organized buyer, that buyer provides a Bill of Material (BOM) that accurately lists the fabric and other accessories required to make the product. The merchandiser then contacts suppliers to obtain the latest prices based on order quantity while simultaneously reaching out to both the pattern making department to determine fabric consumption and work-study department to get an accurate SMV. Once all the information is gathered, it becomes fairly easy for the merchandiser to put the numbers to a costing sheet with formulas to determine a free on board (FOB) cost. Sounds easy, right? Well, here are some examples of how costing is done in many companies. Some companies running a slightly sophisticated operation conduct two rounds of costing: one round called “developmental costing” for a quoted order and then second round called “production costing” once an order is confirmed. The idea behind developmental costing followed by production costing is to tighten the costing process by re-examining the logistical and production requirements more closely. Often fabric yardage and yield consumption (YY) is calculated loosely in preliminary developmental costing with room for improvements to determine actual production costing. Similarly, SMV’s are also re-examined to see whether those in the sample room or any other production technician was able to find a bulk-friendly method of reducing the required minutes to complete the product by suggesting alternative sewing techniques. Most of the time, there will be savings for the manufacturer as required fabric quantity decreases and some of the minutes needed to complete production are reduced. At this stage, the order gets released to the bulk merchandiser. They are also known as the production merchandiser. That merchandiser will then order fabrics and accessories and update the enterprise resource planning (ERP) system where necessary. It is important to note that for practical reasons, the development merchandiser often sends out the fabric purchase order (PO) to the fabric mill well in advance of production to save time and reduce lead time. If, however, the PO is sent before production costing is done, it is vital to revise the fabric PO if there is a change in fabric consumption (YY). The reason the fabric PO is sent as soon as possible is to reserve the production capacity at the mill. Changes to order quantities are possible and won't affect the initially quoted delivery dates. It is advisable to follow the same procedure for all other bookings, such as elastic, tapes, and even thread. Now let's look at the importance of post costing. It means the costing done after the order is shipped to the customer. There are many reasons to conduct this important task. The first and most obvious reason is to ensure that the company stayed within the parameters allocated in the original costing. how much fabric was booked vs. how much fabric was actually used in production? How many minutes were authorized based on the SMV and how many minutes were actually used? How many thread cones were ordered and how many were left in the production line or put in storage? Often one would find that by the time one order is complete, half the thread quantity intended for the next order was also consumed. This happens frequently with orders produced on a staggered delivery schedule and requires that the production merchandiser make additional orders of most of the raw materials even though enough of those materials, including wastage, was originally purchased to cover production of the complete order. Post costing, therefore, is a useful tool to highlight mistakes and misunderstandings inherent in the production process and helps improve the accuracy of future calculations. Another important benefit of post costing is accelerating the reconciliation of all unused materials and extra pieces left over after an order is completed. Many factories just discard all damaged production pieces or leftover raw materials in an empty space of the factory and never look back on them. To complete the post costing process, it is essential to find all leftovers components and segregate them for future use. This process will help to reduce the damage and waste in general. What we have discussed above is the importance of having an upper hand on the order from the time of receiving from the buyer until it gets shipped. Giving due attention to the post costing would help to understand how to reduce and eliminate the waste where possible and improve the overall revenue of the company. About the Author: Dr. Charm Rammandala is the Founder & CEO of IStrategy USA. Currently, he is the Head of Production and Global Sourcing at VOmax GDMC, LLC, which is one of the oldest sportswear companies in the USA. He has over two decades of experience in the fashion supply chain, where he has served in capacities such as Lean Manager and Model himself. He is an expert in rolling out programs in lean apparel manufacturing and sustainable labor costing. His former positions included being the first Lean Technologist at George Sourcing Services UK, Ltd. 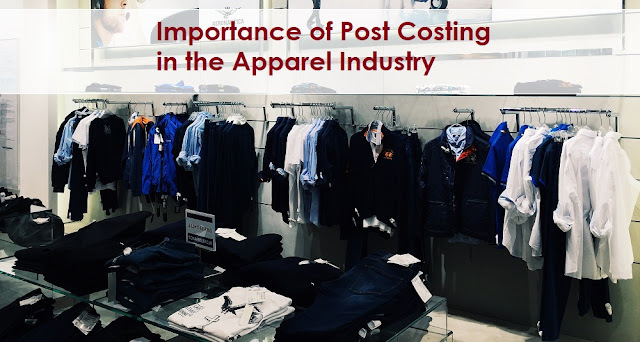 The importance of post costing in the apparel industry. The costing process and reasons for doing the garment costing correctly.